Hymn #46 -- "Glorious Things of Thee Are Spoken"
Franz Joseph Haydn is know as the father of the Symphony (he wrote over 100 of them), the father of the String Quartet (he wrote 68 of them), and the father of Sonata Form (he codified the form which became the most famous architectural structure of musical form). But Haydn was employed as a servant. His employer, Prince Esterhazy of Austria, hired the composer and a full orchestra to provide music for his enjoyment. Haydn pumped out piece after piece numbering in the hundreds. Symphonies, Operas, String Quartets, Piano Sonatas, Concertos, and any other type of music you can imagine from mid to late 18th-century composer. He and his orchestra wore servants livery when they performed. He even wrote the Austrian National Anthem. Hymn #46 is this national hymn set to words about Zion by John Newton. Haydn is one of my favorite composers of all time. His music is filled with joy, positivity, and endless imagination, invention, and humor. I took a class in grad school that focused on his Symphonies. We studied all 104 of them. Actually, there are 108, but that's a topic for another day and time. By the end of the course, we had analyzed ever single Symphony. What a master he was! In addition to all his mastery as a composer, he was a great teacher. Two of his students included none other than Mozart and Beethoven. Every little bit of Hymn #46 is excellently written. The melody is repetitive enough and developed enough to keep us interested throughout. Then harmony tells an engaging story. The climax is resounding but not overbearing. The tune is so well written that Haydn decided to use it as the "theme" for his "theme & variation" movement in String Quartet No. 62, Op. 76, No. 3, movement 2. And as a good servant, wanting to please his master, he named this string quartet that contained his new national anthem, the "Emperor" quartet. Here's a clip of this movement. You'll hear the hymn played exactly as it is written. Then he takes the tune and develops it over the subsequent 4 or 5 minutes in a lovely set of variations. I will be very sad if this hymn is removed from the new hymnal. It is an elegant, perfectly composed specimen and deserves a place in our worship. Did you know this tune is the German National Anthem? Did you know the tune name is Austria?! 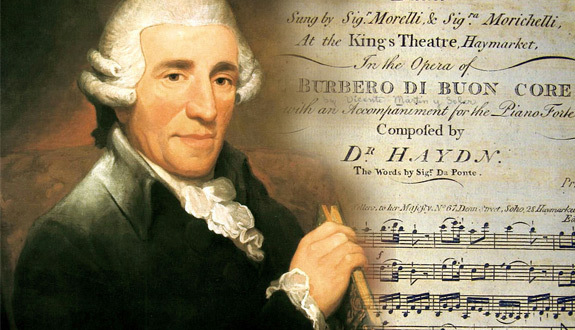 The music, by Franz Joseph Haydn, was written as a companion of sorts to England’s God Save the King for Habsburg Emperor Franz II, as Haydn felt a national anthem was needed like England’s. Known as the “Austrian Hymn,” Haydn later used this melody for his beautiful String Quartet Op. 76 No. 3, often called the “Emperor” or “Kaiser” quartet. Definitely worth looking up and listening to! The pairing of this text and tune is found in several other denominational hymnals. This hymn dances nicely if felt in two. The suggested affect is Majestically, and it seems to me that if you think of the pulse in four, it comes across much more as plodding than majestic. A nice stately two really works well to communicate the majesty of this piece. The half note equal to about 52 beats per minute gives a very stately tempo. I think you could approach registering this piece in a few ways. You could utilize the full organ suggestions from previous postings or you could be a little more understated, perhaps building the principal chorus only to 2’, perhaps with a nice chorus reed, adding the low-pitched mixture for the final verse. For fun, I like to play the melody that Haydn uses for the string quartet during the introduction to give it a little more life as well.